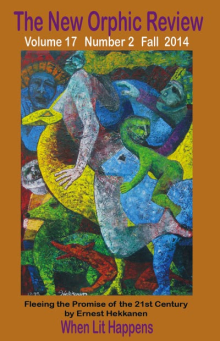 The New Orphic Review is a semi-annual literary magazine that is published in the spring and the fall. It is listed in Poet’s Market, Novel & Short Story Writer’s Market, The Journey Prize Anthology, The Pushcart Prize and Best American Short Stories. It has featured poetry, fiction and essays by authors from Finland, Switzerland, Italy, Ireland, Britain, Chile, Canada and the United States. It frequently includes a Featured Poet section. TNovelette Novelette 7,500 - 10,000 words. It publishes poetry ranging from sonnets to free verse, but the editor-in-chief, Ernest Hekkanen, who describes himself as “an opinionated visionary beholden to no one,” is tough on poets. Formal verse, Free verse, Sonnet.